25 Queen of the NWPA TAR 21	26 28 APA Nationals Hello Rio	32 35 Pool on TV/Computer Broken Rack	33 39 12 Years & Counting To All Potential Advertisers, The Break will promote your tournaments before and after your event. We cater to our advertisers to bring as much exposure to your location as possible with a listing on the tournament trail and in your ad before your event. After we will promote your location and players with an article, photos and the results of your event. Call to see how!!! The Diablo Valley Pool league hosted the 5th Annual Dave Piona Memorial tournament last Saturday September 27, 2011. Sign ups started promptly at 10:30 am and tournament started around 11:45am once Christina Piona and daughter Star had arrived. This was another successful event and it drew total of 51 players, including 14 women from all over the area. We were very fortunate to have names such as George Michaels and Chris McDonald who had actually won one of the previous memorial tournaments held at Vinnies Bar. Friends and players came from Sacramento, Vacaville, Fairfield, Daly City, Livermore, as well as all over Contra Costa County. Aswe all know Dave Piona was not only a personal friend to us but he was also instrumental on the development of our pool clinics and teaching the basics of the game to our new and upcoming players. His friendly disposition and great demeanor will always be remembered. He enjoyed the competition of the Friday night tournament which has been held at Vinnies bar for the last 8 years. It was a place to eat, listen to music and play competitive pool. He had his corner where he always sat and studied the players giving positive and constructive feed back to all. Christina Piona, brought a cd with Dave’s photos his daughter Star had put together for Dave’s memorial. We also had created a favorite play list with all Dave’s favorite tunes such as Eric Clapton, Eagles, James Brown and the Dobbie Brothers. She thanked all for keeping Dave’s memory alive and in a kind gesture proceeded to raise donations for Jeff Gregory’s medical expenses from his recent heart surgery. Christina and the Vinnie’s patrons were able to raise just over $500. Uncle Randy Piona also showed up to salute friends and family. Diablo Valley Pool Leagues and Christina Piona joined efforts and made the pot juicy adding a total of $500 to the pot. Let us also take this opportunity to thank Parker the owner of Vinnie’s Bar and manager Jeanne for offering a delicious barbecue and allowing us to host the event at their house again. We played a double elimination tournament with a race to two only on the winner side and one game on the one loss side. Tournament was run efficiently with 3 bar tables. By 9:00pm we already had our event champion. Congratulations to Jason Williams who had to shoot lights out this day, to win the event due to the excellent caliber of players participating. He had won the memorial tournament #3. He won his matches 3rd George Michaels against Alex Almendral, last years winner, Bart, Bonnie, Johnny, Paul McCaffrey to finally face Paul Bramwell for the hot seat. Paul in the mean time moved through the other side of the winner bracket winning against Mike Sano, Hunter, Mez, Chris Mcdonals, George Michaels and finally meeting Jason Williams to play for the hot seat. For Top woman ($50) Bonnie Bowman participant of the Tiger West Coast Women’s Tour and Canadian player took top honors amongst 14 women. 1st $450	Jason Williams 2nd $250	Vincent Paul Bramwell 3rd $175	George Micheals 4th $125	Chris MacDonald 5th/6th $100	Martin Sherzai, Paul McCaffrey 7th/8th $75	George Williams, Bee Davinson 9th/12th $25	Deo Alpajora, Micheal Suhr, Johnny Argaivdar, Chris Atkins Again thanks to all for taking the time to celebrate with the Piona family and friends. Inside the mind of a WORLD CHAMPION A PLACE MOST SHOOTERS WOULD LIKE TO EXPERIENCE FIRST HAND ARTICLE AND PHOTO BY DAVID TELLER It’s a place most shooters would like to experience first hand but often settle with someone else telling them what is like: what a world champion thinks about when he’s at the table during a match. In Spokane, Varner’s exhibition finished with a challenge match that started two days before. Joe Gilliland of Post Falls, Idaho, beat a pool of local shooters in a Sept. 19 tournament to be eligible to play a race-to-five set against Varner. Al Primm, who lost in the opening round of the race-to-three tournament, came all the way back through the one-loss bracket to beat Gilliland once. In the rubber match, Gilliland capitalized on a crucial Primm miss to win the tournament, 3-2. Nick Varner wowed spectators with trick shots and played challenge matches in a clinic and exhibition at Black Diamond Billiards and Eatery in Spokane, Wash., as part of the Legends and Champions Pool Tour on Sept. 21 and 22. Aside light-hearted anecdotes about playing pool, Varner took questions while explaining what he sees on a table when he shoots. Audience members got tips and advice on analyzing a table for trouble balls and taking the right shots to break them out to where they are playable. He also provided pointers on fundamentals like stroke, concentration, knowing where the cue ball is going to hit and properly aligning on a shot. Against the eight-time world champion, Gilliland had his work cut out for him. Varner broke and ran two tables and was into his third before Gilliland ever took a shot. Varner scratched on the 8-ball to give Gilliland an easy out. It would also be the only out he would get as the soft-shooting Varner effortlessly won 5-1. Varner makes pool look easier than it is. The smooth confidence he has comes from years of experience, not only on the table, but above it. In the clinic that he teaches, Varner said the mental aspect is as important as mechanics. He said too many players think too much about missed shots and poor performance. He said players need to concentrate on the next shot, not the last one. getting national accolades. Since then he has won 80 major titles, been a world champion eight times, has been a world champion in five different pool games, competed in the Mosconi Cup eight times, won back-toback championships in the U.S. Open, was voted Billiards Digest Player of the Year five times and was inducted into Billiards Congress of America's Hall of Fame in 1992. B side with wins over Paul Potier,Don Wirtaman,Eddie Carrido,Stan Tourangeau, & Rich Geiler to meet up with Marc in the finals!!! It was definately a tough battle for both players, but in the end it was Marc who ended up in the winners circle, the final score 7-4. It was Marc Vidal who won the A side point with wins over Doug Enera,Nick Kruger, Lance Mason,Eddie Carrido, & Rich Geiler. Thanks to everyone who played &supported the tournament. Looking forward to the next 2012 summer scorcher. Hope to see everyone at our next big tournament, Malarkeys Thanksgiving 9 Ball Open!!! !, Nov. 25th - 27th. 8 BALL SCOTCH DOUBLES BLIND DRAW Winners of the 8 ball scotch doubles blind draw played Aug 27th at D&R. 1st place - Left to right Don Beuch & John Bemis (top) 2nd place - Left to right Ron Stuart & Lyle Tripp (lower) We are having Qualifiers every Tuesday starting Sept 27th thru Oct 25th, for the Rick John Memorial Tournament November 11th - 13th, 2011 Held at D&R on Sept 17th, thanks to Dan Oneil, D&R holds the Bar Daddy Traveling Trophy for the 3rd month in a row. Lyle Tripp in July, Robert Randall in Aug. This tournament is played every 3rd saturday of the month in Rotation of 4 local Clubs. Up coming events - D&R is planning on Dec 3rd to hold a 9 ball Scotch Doubles Blind Draw & Jan 7th or 14th a Womens 8 ball Tournament. Edwin Montal takes aim in an early match during the open 9-ball tournament held Labor Day weekend in Spokane, Wash.
A pensive Stan Tourangeau studies the table after the break during his match against Rafael Martinez, who won 9-6.
match with Paul Potier, who is making his return to pool after a four-year hiatus. Potier, a two-time Canadian Player of the Year, deposited Montal in the loser’s bracket with a convincing 9-3 win in the fourth round. almost 4-hour long heart stopper to Eddie Mataya. Louie uncharacteristically missed numerous shots and botched safeties to fall behind 6-1. Louie worked out the jitters and mounted a comeback, but fell short, 9-8. In the one-loss bracket, Montal ran over Matt Wood 9-2 before stumbling again and getting in a 7-1 hole against seven-time tournament winner Brady Golan. That’s when Montal found his stroke and commanded the table to rally back and win, 9-7, giving Golan a seventh place finish. The hot streak continued as Montal blistered Eddie Mataya 9-1, then avenged his earlier loss against the one who put him in the loser’s bracket, Potier, beating him 9-3. Later in the tournament, after eliminating Louie 9-1, Seattle resident Mark Vidal would eventually go up against Potier. Vidal jumped out to a quick 5-1 lead but experience, patience and discipline prevailed as Potier crept back in to win 9-8 and advance to the tenth round. Veteran road player Rafael Martinez made a stop in Spokane, Wash., and won the open 9-ball tournament held Labor Day weekend and hosted by Black Diamond Billiards and Eatery. shot along line C, you need to have more draw on the cue ball. Finally, if you get around the obstacle OK but you miss along path D, you need to take a little draw off the cue ball. Shot 1 may be nearly impossible on old, sticky cloth. If you think that could be a problem or if you just want to see some amazing cue ball action, rub the cue ball with silicone spray, such as ArmorAll. That will delay when the draw takes and you will get much more dramatic curves. In Shot 2, finesse is needed rather than power. It gives even very good players trouble unless they have tried to play it before. The mistake most players make is to hit the one ball too thinly or too hard so that the cue ball hits the cushion before it has time for the draw to take and curve back towards the 9. The technique needed is “dead draw” which is standard in carom billiards. Hit the 1 ball nearly full with just a little draw and quite firmly. Since you are taking draw off the ball, you need to compensate by hitting the cue ball harder than you normally would for that distance of draw. Once you have the technique down reasonably well, modify the position by moving the cue ball farther from the rail. How far out can you move it and still make the shot? the front leg. Depending on your body type, the positioning of the front foot can vary dramatically. Use this illustration to help you develop a solid stance. The platform from which we deliver the stroke is vital to success. The quality of our performance is found in how solid our stance is. Once I land on the cue ball I then extend my buttocks away from me. With the weight on my left foot and very little pressure on my left arm, I am able to see the shot and shoot the shot as it calls for. “See the shot-know the stroke-shoot the shot.” If for some reason you line up and you are not happy with what you see, stand up and go through your Pre Shot Routine again. Do this until you are satisfied with your stance and alignment. In other words, don’t shoot until you are ready. The reason we are not ready to shoot is we are not standing in line with what we see. Some of us try to wobble a bit and get in line. We get in line, but we are not balanced and thus cannot deliver a good stroke. A poorly delivered stroke gives us negative results. Precise body and cue alignment are some of the most important parts that must be in place before shooting. Accurate foot alignment forms the basis for a pure and straight stroke and thus the fundamentals for a good game! The master is one who is in line with the shot each and every time he goes down on the cue ball. If you are in line, you will not have inner game chatter going on in your head. This is why you need to work on your fundamentals day after day until you have them mastered. Go through the Lesson book, work on each shot with great attention to your Pre Shot Routine and your timing. Do not do anything unless you are in line with the shot and ready to deliver a committed stroke. You are in control of your results. Be particular and win more games. 2011 CHAMPIONS The 2011 World Pool-Billiard Association (WPA) World Junior 9-Ball Championship was held in Kielce, Poland on August 31 – September 4, 2011. Junior billiard champions 18 years old and younger traveled to Poland from 21 countries to compete for the world titles in both boys’ and girls’ divisions. Europe reigned, with Oliwia Czupryńska and Marek Kudlik of Poland winning the gold. Behind The Rock Tour 2nd Tri-Annual Event THE PAYOUT WAS GREAT AND THE PLAY WAS UNBELIEVABLE! “Half measures avail us nothing.” The origin of this quote is unknown to me but what I do know is that it couldn’t be truer. I can recall numerous instances in my life where my indecisiveness led to my inability to give 100%. As a result, this would always lead to failure, or at least not the successful outcome I desired. I was first introduced to this passage in 2004 by a former coach and mentor. He would repeat it over and over when he could see that I wasn’t fully committed to the shot or a decision. I never fully appreciated what he was saying to me until lately. In a recent professional turn in my life, I’ve found myself in a position where I have too many roles. Between managing, marketing, writing, teaching, reporting, and just simply trying to be a good wife, I was doing the best that I could but for the first time in years, I revisited the words of my former coach, “Half measures avail us nothing.” We all wear many hats in our lives. We may be parents, teachers, neighbors, or pool players. Whatever the role may be, it’s impossible to give any of them 100% without awareness. Awareness is what allows us to identify with the specific task at hand and to perform it to our best. Awareness affords us the opportunity to enjoy ourselves when we accept a challenge. Without awareness, we would not be able to take full measures. Examples of full measures we can practice in pool: 1. Do not look ahead on the tournament bracket. Only focus on the one match you are about to play. Too many times, I’ve seen players psych themselves out by whom their next opponent might be if they win or what time their next match is. 2. When shooting two-way shots, have a specific plan on which is more important, either the safety or the offensive shot. When we divide our efforts between both shots, often times we can miss them both and leave the table for our opponent. 3. If you show up to play in a 9-ball tournament, focus on the tournament. Try not to get caught up on any side action shenanigans. If your focus is to have a positive outcome at the tournament, gambling and playing other games will only distract you from the main event. 4. If you’re ever unsure or not fully committed to the shot, stand up and start the shot over again. Shooting while undecided will only reinforce bad habits. 5. While in a match, shut off your phone. The only way you can do your best at whatever it is you’re doing is by giving it your undivided attention. The only way to avoid regret and disappointment is to always do your best and give all of yourself to whatever it is you’re doing. If you don’t succeed then you cannot blame yourself for not giving it 100%. If half measures avail us nothing then full measure will avail us everything. DVPL women’s summer session of 2011 came to an end last September 2011. The league played a single round, it being summer session and after 14 weeks of continuous play, we got our Summer 2011 new champions the Office’s team “Secret Sauce”. Congratulations to them. The Office team “The Secret Sauce” joined us this summer without their heavy guns El Callado. However, the Domingo sisters Denise and Darnell “aint” no joke when it comes to stroking the ball, and Selena Castaneda complements the Domingo sisters making this group a “dangerous” team. They brought in Jolene Akin who as the season went along seemed to develop her skills and confidence which helped the team win the number one spot. Congratulations to Denise, Darnell, Salene, and Jolene. new mix to the league. Aleshia Byrnes, one of the original captains from 1995, returned to the game of pool after being retired for years. We are glad to have her back. Her game is still strong and we hope that she will join us in the winter coming season. Another veteran who had also retired for a few years, Karolyn Covione came back to play and hopefully she is here to stay. Tracey Datuin joined them for the fight and was key in a couple of matches. She is pretty new to the game as well and has the potential to become one of the best. Last but not least veteran Stacy Wilson also played for this team. The Peppermint Patties from Vinnie’s bar always tough struggled in the middle of the session but came back strong at the end to regain their usual top place. National BCA and ACS Champion of 2011 Shawn Modelo plays on this team along with veterans Leslie Bernardi, Cathy Reaves, Erin Mckibben and Deanna Spoomer. This team is full of skill and experience. Shawn Modelo won the honors of top female shooter and most improved average for the summer while Leslie Bernardi followed up taking second place in top shooter. On the 7th spot Cj’s Salt and Peppa holders led by Barbara Martisch held their own this session putting teams through the ringer. Always dangerous Barbara was joined by Mary Jackson, Roxanne Skane and Theresa Teague who is another always dangerous shooter. They were only three round points from the triple tie for third…and promise to only get better as they play together more. Keep you eyes open for Mary and Roxanne, they are new blood in the women’s league and have great potential . She placed 10th on the top shooter list. She is strong and depending on where the sun, the moon and the stars are, she might blow you out of the water. This team was also on the triple tie for third and couldn’t hold on to their spot when it came to the finish. Todd Gooch and Andrew Monstis, claimed 1st place in the 3-man 9-Ball team event. Chris had his first National Championship. He spent a lot of time watching the US Open where many of the pros were playing. It was a trip, and experience, he is not likely to ever forget. He is eager for more. Chris got another invitation to attend the July 2011 Junior Nationals. Excited to try again, he had a desire for a chance at a scholarship. He could also make a team to represent the United States at the Junior Internationals. Chris fell short and came in 7th/8th again. A little disappointed that he didn’t do better, he recognized there are other very talented young players his age. Chris is in the upper echelon of current young players across the country, and is hoping to make the big time. Some have given him the nickname “The Devastator”, which reflects how some feel after playing him. Chris Byers is considered one of the top homegrown young talented pool players to come out of the Portland metropolitan area. It is an honor to be mentioned with other homegrown teenage pool legends of the past 45 years like Frank Armstrong, David Rhodes and Leo Newberry. He wants to develop to be better with his pool game and his character. Chris has some uphill battles. The hometown pool arena is not thriving in recent years as it once was. The excellence of pool as a sport has lost its compass in promoting a higher level of play. There is little to no action. Players are rarely matching up and there are no open tournaments. It has succumbed to what some call a B player mentality. A lot of the industry emphasis has been on the bulk of recreational players and making a buck. It’s probably good for the sport in some ways, but little support exists to strengthen the above-average and top local players. It is hard for Chris to advance his skills. There are no tournaments that he can play in, no action. All the tournaments are for adult players and money driven. He understands he needs to advance with more experience to be part of the higher level of the sport. He would love to have players to play and to have action to be a part of. Chris has to travel many miles to be allowed to compete, not because he is too good, but to be part of a genuine pool environment. It takes resources like a car and money, and is expensive to get out of town to obtain pool experiences. Traveling distances to pool tournaments and juggling going to high school is really problematic. He knows he needs to finish high school to pursue his passion. His pool options are limited. He has to wait until he is an adult to be able to excel. He might also have to consider moving to another area of the country where pool is thriving. He would have to attend a new high school just to be able to pursue the sport of pool without major travel. He could take on the task to positively cultivate a change in the local pool attitude. It is possible for him to take it on, but as a teenager he will have a hard time doing it alone. It would take time and would be a real learning experience, and maturing process, too. Chris will be an adult some day and much of this will be behind him. Chris wants to get a drivers license and get a car, what kid doesn’t. Chris loves video games and playing basketball. He has aspirations to go to college and become a health professional. He has a desire to be a pharmacist or a nurse. Growing up is demanding; understanding and experiencing the trials and rights-of-passage is key. It is a task to try to stay calm, cool and collected. He will have to deal with new challenges, discover who his real friends are, and show appreciation for those who have helped him. He will have to learn the “Rule of the Road of Life”. No one knows what the future will hold for Chris Byers. It’s hard for him to imagine himself doing something other than playing pool right now, except basketball. Maybe Chris can make a difference in the local pool scene. He could wisely help promote and develop pool, and restore its excellence in his hometown and even beyond. It is this author’s hope that, down the road, he will not only be known for being a great pool player, but also a well-rounded, fine young man. heat as players returned to claim the to prize. Unfortunately there are always winners and there are always losers. Eddie Mataya and Rafael Martinez remained the two players that were undefeated. However, Martinez was eventually sent to the b-side as Eddie Mataya claim victory and awaited the winner of the loser’s bracket. After his lost, Stan Tourangeu showed that he was a player to be reckoned with as he defeat all those players that came to challenge him. Val Alvarado ,meanwhile, was also proving that he too was capable of sending players packing, only to come head to head with Stan. Stan came out the victor in that match up. The unexpected twist to the game came as Rafael Martinez graciously bowed out the battle for second place to Stan due to personal reasons. Both Stan Tourangeu and Eddie Mataya are experienced tournament players who battled it out for first. The match was a close one. Once again there is always a winner and there are losers and today Eddie Mataya climbed the victory ladder as he defeated Stan. Stixx and Stones and the entire staff would like to thank all the players during the past few days, as they demonstrated their Stixx and Stones were racked and pocketed. We would also like to thank our title sponsor Mueller for their support. Please continue to show your support of the NWPA by going to Mueller’s website at www.mueller.com. Mention the NWPA during your order and receive a discount on all Mueller merchandise. Raffle tickets are still available for the Year End Event that will be hosted at The Parlor in Bellevue, WA on November 19-20th, two for $5/five for $10, need not be present to win. Liz Cole brought some donated Chocolate for raffle at this event and Debbie Cicchitti was the big winner. Rail2Rail Productions provided a free Live Stream for the entire event. Along with Rail2rail staff, Guest commentators included Leo Violette, Kimberly Kirk, and Jana Montour. Billiards 911 Trivia Challenge winner Pauline McGrath aka luckoftheroll won a box of blue Master chalk and a 5 QClaw. Rail2Rail’s next live streaming will be a Breast Cancer Benefit concert in support of the American Cancer Society on October 7th, and their next pool coverage will be the Western BCA Regional 9 Ball Championships from Lincoln City, OR October 11-17th. when missed shots and safes by Liz, late in the racks, resulted in Jana capitalizing on her opportunities. Jana ended Liz’s winning streak (last two NWPA events) to claim the Queen of the Fleece title and move up in the rankings from 4th to 2nd place; however with Liz’s strong finish she solidified her position on top of the standings and will be the 2011 NWPA Tour Champion.Great job ladies! On September 17-18th, Golden Fleece hosted the NWPA’s 6th Tour Stop of 2011. Located in Kenmore, WA, the Fleece has ten 9-foot Diamond and ten 7-foot Diamond tables, some of the toughest equipment in the great Northwest. Newly renovated the room now offers a menu of food and liquor to go along with its action filled atmosphere. Tournaments offered include Friday night 9 ball on the big tables, Saturday night 9 ball on the small tables, and the room is trying to organize 1 Pocket tournaments for Sunday afternoons, also on the big tables. We would like to thank the Golden Fleece for their continued support of the NWPA, they have hosted two events per year since 2009 and the warm reception by owner and staff makes their stops some of the favorites for the ladies on tour. As Yogi would say, déjà vu all over again. Just last month in Sacramento Bonnie lost the hot seat match, fought her way back to the finals and took the first set. Only her opponent—then Mary Rakin, this time Eleanor Callado—was different. Since the tournament is true double elimination, a second set, race to 5, is needed for a player from the one-loss side to win. This second set was back and forth from the beginning. The two players went to hill-hill. TWCWT plays alternating breaks and the break in the 9th and deciding game was Eleanor’s. Her demeanor as she approached the table was all business. Calmly she broke and ran out to earn her second victory of the 2011 Tour. n September 17 & 18, Tiger West Coast Women’s Tour (TWCWT) returned to South First Billiards Club in San Jose, CA for its fourth stop of 2011. Thirty-seven players entered the double elimination, race to 7 on the winners side tournament. On Saturday we played down to the final 8 in the Main Event. TWCWT is putting an emphasis this year on moving players through the brackets as efficiently as possible. In particular, the race on the one-loss side has been reduced from 7 to 5. We’ve also adopted guidelines for the maximum time we think a match should take and try to let players know when their matches are falling behind that pace. As at each of our tour stops, final eight action on Sunday was livestreamed by West Coast Pool Players. If you can’t join us in person, go to their website and click on the link to check out the action and chat online with commentators. Mary Rakin, winner of the previous two stops, faced Holly Robinson in her first match. Holly has been playing strong this year and took 3 games from Mary before losing the match. She then proceeded to work the one loss bracket winning against Anita Azevedo, Tammy Moredo, Carolin Koo, Rachel Byrkett and finally Jessica Skye to make it to the top 8 . On the winners side, Mary took a match from Kacie Ragen bringing about a meeting with fellow WPBA pro Eleanor Callado, who had defeated Rachel Byrkett and Brenda Clark in her first two matches. After a tough 7-5 contest, El remained on the winners side and Mary moved over to the one-loss side. Meantime, Revelina Um, returning to play after the August 1 birth of her second daughter, Lindsey, scored wins against Greta Garbo, Jess Quinata and Jessica Skye , setting up a Sunday morning match with El Callado to see who would play in the hot seat match. play in the second chance tournament Sunday. Our thanks to South First owner Ben Soriano and his staff. Ben added a combined $750 to the main event, second chance and end of season prize funds. South First is a great space to spend a day in. Large and airy with outstanding work by local artists displayed on its brick walls, it has a full bar, a full kitchen with an extensive menu, TVs, ping pong, other games and lots of space to spread out. Stop by if you’re in the area. They host a Worldppa handicapped 9-ball tournament every Tuesday night. On the other half of the chart Bonnie Plowman scored wins over Erin McKibben, LoAnne LaFlamme and Emilyn Callado while Shawn Modelo defeated Tracy Palma, Kristin Eisen and Tanner Roo, putting Bonnie and Shawn into the final 8 still on the winners’ side. Tiger Products once again provided merchandise to be raffled off for the benefit of the Tour. The winners of the raffle were: Erin Mckibben, Cap; Nick Prathe, Shirt; Jaime Dizon,Polo; DJ from Crown, Low Deflection Shaft. Magic Rack donated the racks used in our matches. Sunday morning when the main event resumed Eleanor Callado won her match with Revelina Um and Bonnie Plowman beat Shawn Modelo. Tracy Palma, who’d come back after losing her first match to take three straight, made it four by defeating Tanner Roo. Holly Robinson, who has been getting lots of practice playing Mary Rakin lately (twice in this tournament and in the first round of the final 8 two stops in a row) had her tournament ended by Mary in 7th/8th place. They carried the competition over to the ping pong table, no word on what the score was there. Mary went on to defeat Shawn Modelo, while Tracy met good friend Revelina Um with Rev coming out on top. We deeply appreciate the support these companies are giving women’s pool and also that of sponsor Diablo Valley Pool Leagues. In what has rapidly become one of our favorite fundraisers, therapeutic massage by Eileen Hanshaw was available during the tournament on Saturday and Sunday with a portion of the proceeds donated to TWCWT. The upset of the day came when Rev defeated Mary Rakin, putting Mary out in 4th place. Mary had only finished lower than second twice in the last three years. “I was waiting for her to get in her groove, because I knew when she did I’d be gone,” said Rev, “but she never did”. Looking slightly stunned after her win, Revelina had to get her head back in the game quickly to face Bonnie Plowman, who had lost the hot seat match to El Callado. Rev played tough, but ultimately went home to baby with a satisfying 3rd place finish. Bonnie started the final match against Eleanor Callado by winning the first two games. She was on the verge of going up 3-0 when she missed a very makeable 9 ball. El sank it to get on the board and went on to take the next two games to go up in the match 3-2. Bonnie came back to tie it at 3, El went ahead 5-3 but Bonnie doggedly kept the pressure on and brought the match to 5-5. The next two games were nail biters, but Bonnie took them both for a 7-5 victory. Runners-Up, Queen Bee’s received $5,000 in cash. In the semifinal round, Snook Hers defeated Simply Stuhned of Guelph, Ontario, Canada, 3-2. Queen Bee’s advanced to the finals with a 3-2 win over Just Chickens of Moore, Okla. Simply Stuhned and Just Chickens tied for 3rd Place and each received $2,500 in prize money. All teams in the 8-Ball Championships squared-off in a modified singleelimination format that ensured each team played at least twice before elimination. All 8-Ball Open Division teams automatically received $350 in national qualifier money, and the top 8 teams won at least $5,000. In the 8-Ball Ladies Division, all teams automatically earned $350 national qualifier money, with the top 8 teams winning at least $1,000. The Open Division began play on Aug. 21 and concluded on Aug. 27. The Ladies Division of the tournament started on Aug. 18 and concluded on Aug. 21.
to all APA members. The MiniMania tournaments offered multiple formats with 100% prize money payback that awarded nearly $250,000. The APA produces three major tournaments each year—the APA National Team Championships, the APA National Singles Championships and the U.S. Murder by Numbers The APA, based in Lake Saint Louis, Mo., sanctions the world’s largest amateur pool league, known as the APA Pool League throughout the United States, and as the Canadian Pool League in Canada. Nearly 270,000 members compete in weekly 8-Ball and 9?Ball League play. The APA is generally recognized as the Governing Body of Amateur Pool, having established the official rules, championships, formats and handicap systems for the sport of amateur billiards. Amateur Championship—that, together, pay out more than $1.5 Million in cash and prizes annually! The APA and its championships are sponsored by Aramith, Action Cues and PoolDawg. For more information on the National Team Championships, visit the official APA website at www.poolplayers.com. Ma’s 1st Sunday of the month Scotch Doubles Tournament took place on Sept. 4, 2011. Seven teams showed up to compete for the money! With a $5 entry fee per person and Ma’s adding $45, the total pot to be won was $115. In the end, Tom Gudmundsen and Glenda Bell took 1st place for $55. Lynn and Dianne Krause finished 2nd for $40 and Steve Mendoza and Gayle Gould took 3rd for $20. Our next Scotch Doubles Tournament will be Oct. 2nd at Ma’s Tavern in Albany. Sign ups start at 1 pm and play begins at 2 pm. The format is a race to 2, eight ball using BCA league rules. Exception: If a team consists of 2 Masters, they must race to 3! So come on in with your partner and try out your skills before Regionals!! ark Griffin and CueSports International (CSI) announce two major changes for the BCAPL National Championships. In 2013, the “Greatest Pool Tournament in the World” will move from May to July … and will walk the welcome mat at the Rio All-Suite Hotel & Casino in Las Vegas. especially for those who have school age children. This move is long overdue, and we again thank the players who participated in our survey. The Rio is part of the Caesars Entertainment Corporation – the world’s largest casino entertainment group. With its state-of-the-art conference center of over 160,000 square feet, the atmosphere is elegant, modern and hi-tech – a player’s dream! For player comfort and convenience, the Rio is a 4-star all-suite hotel and casino offering extensive amenities and entertainment options. Providing spectacular views of Las Vegas, the hotel boasts over 2,500 suites with more than 600 square feet of spacious luxury. When it comes to dining, the Rio is unparalleled. According to USA Today Travel 2011 report, the Rio’s Carnival World Buffet and the famous 5 star Village Seafood Buffet are ranked #2 and #3 in the top 5 buffets in Las Vegas. Additionally, the Rio offers 12 more dining options from the casual to the opulent. You name it … the 24-hour $45 “Buffet of Buffets” pass to 7 of the best buffets available anywhere; a 48-hour “All-Stage Pass” to about 20 shows at Caesars properties; the industry leading “Total Rewards” player program by Caesars Entertainment; the free Rio/Paris/Harrahs shuttle service to two key spots on the strip; VooDoo Beach with real sand beaches, cascading waterfalls, four swimming pools and five Jacuzzi-style spas; VooDoo Rooftop Nightclub, an indoor/outdoor double-decker club known to have the best view of the Las Vegas strip … You name it, the Rio has it all. For complete information on the BCAPL National Championships at the Rio on July 17-27, 2013 … www.playbca.com To visit the official web site for the Rio All-Suite Hotel & Casino … www. riolasvegas.com Since 2004, Mark Griffin and his team at CueSports International (CSI) have diligently pursued “More Choices for All Players.” During that time, CSI has directly paid out approximately Seven Million Dollars to pool players. On September 5, The Broken Rack celebrated the end of summer with its annual Labor Day Open 8-Ball Tournament. The format was double elimination, race to 3 on the winners’ side, race to 2 on the one-loss side, alternate breaks. Despite the balmy weather in the Bay Area, the maximum field of 32 filled quickly with a few disappointed players turned away. The entry fee was $20 and The Broken Rack added $200. Thanks to all the players who turned out. Thanks to Alex Bradley who carried out his Tournament Director duties in his usual calm and efficient manner. Check out the Broken Rack’s Worldppa Tuesday night handicapped, single elimination, race to five 9-Ball tournaments. The first Tuesday of each month features $100 added with a field of 16 or more players. Entry fee is $15 and membership in Worldppa is free. Play starts at 8 pm. We’ll be hosting a $500 added Worldppa 9-ball tournament on Saturday, January 28, 2012. The contest will be double elimination, race to 5 on both sides and the entry fee will be $20. To qualify players will have to have played in 6 Worldppa tournaments at The Broken Rack between Sep. 27, 2011 and Jan. 24, 2012, or in 10 Worldppa tournaments L. to r. Dao Alpajora, 2nd place, Jared Williams, 1st place, Alex Bradley, TD here between February 2011 and Jan. 24, 2012. Watch our website, www. thebrokenrack.com, for more information. As in the past, a wide selection of top notch players found the format offered a pleasant way to spend an afternoon and evening on a Monday holiday. Everyone was very happy to see Jeff Gregory among the entries. Just 5 weeks out from open heart surgery, Jeff had been given the go ahead to drive and exercise and-while not looking exactly 100% healthy--finished in the money as usual. It’s a shame Jeff had to go through this ordeal but it’s been nice to see the way Bay Area pool players have come together to offer him their support. Two women, Bonnie Plowman and Holly Robinson, took up the challenge to play with the guys and both played well finishing in the 9th-12th bracket. two games of the finals before Deo got on the board. With his Diablo Valley Pool League buddies and brother Jason rooting him on, Jared wasted no time finishing out the match 3-1. BCA, APA & TAP Leagues FREE Pool Mondays! To all Pacific ACS players it is my sad duty to inform you that Emerald Queen Casino has had a change of heart about hosting our event next year and has cancelled the dates. I have tried to negotiate with the casino to no avail and at this time feel that nothing will happen to regain them as a venue at this time. We are looking for a replacement site and I am actively in talks now with a possible replacement venue. We will keep you informed of new developments when we have positive news as to where and when we will have our event. bunch of people standing in line about a block long,” Varner recounted. “So I asked, ‘Where are these people going?’ And the guy says, ‘They’re coming to see you.’” Varner remembered that when he first started out, he “never dreamed” he would accomplish everything he’s done. “I’ve traveled all over the world, I’ve been able to make a comfortable living playing a game, and my hobby is my work,” said the down-to-earth country boy, who was the second player in history to win over $100,000 a year. “It’s been a hell of a ride.” But as a family man, Varner made it clear that pool is only part of his life. “I’ve got three kids. My son is a CPA, and my daughter is a pharmacist, and I’m more proud of that then anything I’ve ever done on the pool table,” he said with satisfaction. For Sallys Mix-another Vinnies team this summer was a very difficult one. Sally Harvey was joined by veteran Brenda Johnson, Cary Wolcott, Stephanie Guinn and their newest addition Lauren Rutkovitz. They fell apart in the middle of the session giving up all 5 rounds to the opposite teams, which set them up behind the pack. They are talented and have the experience in their group. This team just needs to regroup, put the summer behind them and be ready for next winter session. Good luck to them. They place 10th this session. The Diablo Lanes –Sharp Shooting Divas led by Cocoa Huey is another up and coming group which promises nothing but good things for the young and new talent of the league. They were joined by Lelani Ching, a very dangerous shooter hungry to run out on every game. Dana Sanderson, Miriam Hudson also made up this talented group. They placed 11th this summer. Farrington’s team The Four Cues led by veteran Carmen Millholland struggled this session. Again this group is a relative group to our league and more play time and experience can only help them do better next session. Carmen was joined by Patti Brown, Carmalita Millholland and Carmel Piper They placed 12th on the standings. And last but not least Tonya's Mix. Let us take this opportunity to welcome our newest captain to our league Tonya Daniels. She played for the first time last summer with Brenda Clark, and accepted our offer to run a new team this summer to host all new and fresh talent. If I may say so myself she did a remarkable job being the captain and tortured a few of the top teams when they played them. She was joined by Kristen Pettersen, Lisa Turner and Nichole Shannon. (Cola). The Break Magazine has been revolutionizing the way we view a billiard magazine for over 11 years now by becoming the first pool magazine to go exclusively to both the print and digital media. The Break appeals to pool players as well as billiard enthusiasts. The billiard lifestyle is represented by pros and amateurs alike, from pool leagues to international tournaments. With a print and digital readership of over 25,000 each month - local, state, regional, national and global, making it a truly international publication. The Break brings to its readers up to date results, tournaments, product reviews, feature locations and exclusive interviews. 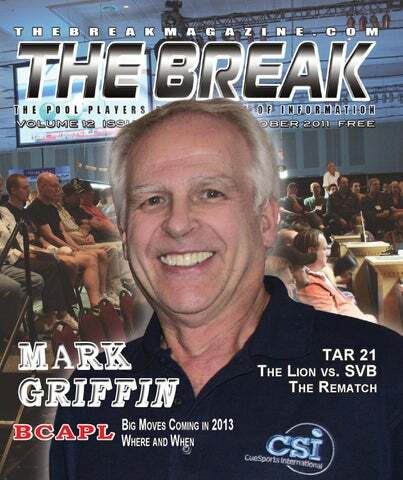 The Break has broken the mold on what a pool magazine should be by reaching local and global readers interested in this game. Proving that both digital and print magazines are the wave of the future when used in combination. We are now in our 12th year of publishing The Break and we thank you, the pool players, for making us the best we can be. WPBA Tour Championship 8/9 Ball Rick John Mem M/W	9-Ball So. Willamette Valley players	8-Ball Barbox West Coast Cue Show	9-Ball Handicap races	Year End Event	One Pocket - Race to 3 - DE	9-Ball Tour at The Broken Rack	9-Ball - Race to 7	8-Ball Scotch Doubles-Hdcp	9-Ball Scotch Dbls Blind Draw	9-Ball on 9’ - Race to 9	Straight Pool	9-Ball So. Willamette Valley players	One Pocket - Race to 3 - DE	9-Ball Jay Swanson Mem. 8/9/10-Ball Bar Table Champ.